Tracheobronchial foreign bodies are most commonly caused by aspiration and can result in a spectrum of presentations, from minimal symptoms, often unobserved, to respiratory compromise, failure, and even death. The epidemiology of tracheobronchial foreign bodies is bimodal, with peaks at the extremes of age. Children aged 1-3 years are particularly at risk because of their increasing independence, mobility, and curiosity; decreased intensity of parental supervision with increased age; and the frequent tendency of young children to investigate their environment with their hands and mouths. Children in this age group are at risk for aspiration of various foods (grapes, raisins, nuts, seeds, candy), small toys, and balloons, as well as any object less than 1.5 cm in diameter. Elderly patients are also at risk, particularly those with primary neurologic disorders such as stroke, Parkinson disease, and dementia, as well as patients of any age with a decreased gag reflex due to alcohol, drug overdose, seizures, or trauma. Any number of substances or objects can be aspirated, including food, gastric contents, pills, dental appliances, and teeth. A third category of at-risk individuals is those undergoing procedures with sedation, particularly dental procedures or emergency intubation. For excellent patient education resources, visit eMedicineHealth's Digestive Disorders Center. Also, see eMedicineHealth's patient education articles Choking, Swallowed Object, and Bronchoscopy. Aspirated foreign bodies most commonly are lodged in the right main stem and lower lobe. Aspiration has been documented in all lobes, including the upper lobes, though with less frequency. In adults, vegetable matter, meat, and bones rank highest, followed by dental and medical appliances. Aspiration of teeth after trauma is occasionally observed. Annual death rates from aspiration of foreign bodies range from 350-2000 in the United States. Most are children, particularly aged 1-3 years. The most common etiology of aspiration deaths in children is a toy, with balloons accounting for 29% of deaths. Foods most responsible for aspiration deaths in the United States are hot dogs, candy, nuts, and grapes. The mortality rate of tracheobronchial foreign body aspiration is approximately 1%. Age frequency is bimodal, with individuals aged 1-3 years and those in the seventh decade of life at higher risk of foreign body aspiration. In adults, aspiration occurs with choking after eating or choking when holding a foreign body in the mouth. Aspiration should also be suspected in adults with respiratory distress associated with sedation from drugs, alcohol, or trauma; after medical procedures such as sedation or intubation; after facial trauma; and in patients with decreased ability to handle secretions. In particular, patients with strokes, either new or old, are at high risk for aspiration. Choking or coughing is present in 95% of patients presenting with foreign body aspiration. Stridor is commonly present with upper airway or upper tracheal foreign bodies. Patients may present with respiratory distress, pneumonia, pulmonary edema, or wheezing. Stridor in children or adults indicates a partial upper airway or tracheal occlusion and is an ominous sign. These patients require prompt interventions. In children, the primary factors leading to aspiration are underlying curiosity about the world and the oral phase of children aged 1-3 years. Loose, small objects and food found around the household increase risk. An older sibling feeding younger children is an important historical clue. Objects that tend to stay in the mouth for prolonged periods of time, such as gum, sunflower seeds, or hard candy, also increase risk. Eating while lying supine, especially just prior to falling asleep, increases risk of aspiration. Baby powder can be a particularly dangerous aspiration. A symptom-free period may occur before suffocation. Immediate lavage of bronchial system is required in severe cases. In adults, factors that increase risk are underlying primary neurologic disorders, such as senile dementia, mental retardation, seizures, strokes, and parkinsonism. Conditions that depress the central nervous system, cause coma, or depress the gag reflex, such as alcohol, narcotics, barbiturates, or benzodiazepines, can increase likelihood of aspiration. Meats, bones, and medical and dental appliances are the most commonly aspirated objects in adults. In patients who have sustained facial or dental trauma, including traumatic intubations, who have a missing tooth, the tooth must be presumed to have been aspirated, and radiographic evaluation is needed. CBC and sedimentation rate may be elevated, particularly with chronic foreign bodies. In patients going to the operating room for bronchoscopy, routine preoperative laboratory studies are indicated. Computed tomography (CT) is rapidly becoming the imaging study of choice in stable patients with suspected aspiration. [12, 13, 14] This is especially true because the majority of tracheal foreign bodies (plant seeds) are radiolucent. CT is very accurate in identifying and localizing foreign bodies. Hyperlucency and atelectasis are observed in 63% of cases in children. Bilateral decubitus films may be helpful in children. 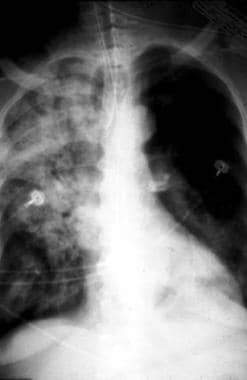 A foreign object may prevent normal pulmonary collapse when the involved hemithorax is dependent (or on the "down" side, on the radiography table). However, a recent large study brings into question the test accuracy and clinical benefit of these radiographs, showing an increase in false positives without any increase in true positives. In very young children, decubitus films are not helpful. Expiratory films may be of some benefit. 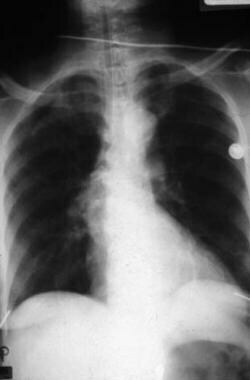 Fluoroscopy may show Holzknecht-Jacobson phenomena (swinging mediastinum). In patients with stridor, a soft-tissue lateral film of the neck may be useful. A tooth (molar) was dislodged during intubation and can be observed in the right hilum. It was not noticed on initial review of this film. A tooth (molar) was dislodged during intubation. The patient developed a lobar pneumonia from the tooth, which on this radiograph has migrated to the left hilum. Attempts at removal by bronchoscopy were unsuccessful, and the tooth was removed surgically. Bronchoscopy may be necessary to assist in making the diagnosis when other tests do not reveal the problem. If the patient is coughing, wheezing, or is stridorous but maintaining an airway, do not attempt to intervene; transport to the nearest facility where definitive treatment can be provided. If severe airway compromise or total obstruction occurs, attempt chest compressions, back blows, abdominal thrusts, or the Heimlich maneuver. The method depends on the age of the patient. Initial supportive therapy includes oxygen administration, cardiac monitor, pulse oximetry, and intravenous line. Definitive airway management may be required. In stridorous patients, racemic epinephrine via a nebulizer may be a temporizing measure until bronchoscopy can be performed. In patients who are unstable, emergent management in the ED is needed. Magill forceps have been used with some success in the ED for foreign bodies located below the cords but above the cricoid ring. With the laryngoscope, this may be the quickest method of removing foreign bodies above the cricoid ring. The preferred method is an awake examination, allowing the patient to maintain his or her airway. The use of ketamine, a short-acting dissociative anesthetic and analgesic, may be useful in this examination. Although the agent produces a dissociative state, the patient maintains respiratory and airway reflexes. The drug is short acting, with an action duration of 15-30 minutes. The dose is 1-2 mg/kg IV or 4-5 mg/kg IM. Laryngospasm is an uncommon adverse effect. In children, ketamine can cause increased salivation and respiratory secretions; atropine is often given in adjunct in a dose of 0.01 mg/kg (maximum of 0.5 mg). For further information, see Sedation. In unstable patients, rapid sequence intubation may be needed. In these cases, be prepared with suction and Magill forceps. In emergent situations with tracheal foreign bodies below the level of the vocal cords, intubation may be required. One option is to insert the endotracheal tube all the way to the hub, thus pushing the foreign body down into a mainstem bronchus (normally, the right). The endotracheal tube is then removed to the normal position (normally 20-22 cm at the lips in adults), and the patient is ventilated after ensuring the tip of the tube is not occluded with the foreign body. Even though only one lung will be ventilated, sufficient air exchange and oxygenation should occur to allow the patient to be taken for formal bronchoscopy. Bronchoscopy is performed with general anesthesia in the operating room for children, with inhalational induction generally preferred. Adults may tolerate awake or sedated bronchoscopy if nebulized lidocaine (4%) is used. Complications of bronchoscopy generally are uncommon and self-limited. However, in-hospital mortality is reportedly 1-2%, partially attributable to large tracheal foreign bodies lost during a procedure. The lost foreign body may become lodged in the subglottic region, causing complete airway obstruction. If initial bronchoscopy is unsuccessful, a repeat attempt usually is performed. Rarely, a second attempt is unsuccessful, and thoracotomy is necessary. If the foreign body has expanded (as can occur with organic matter) or is larger than the subglottic region, a tracheostomy may be required. Admit patients with suspected foreign body aspiration to the hospital. These patients require bronchoscopy, observation, and possibly antibiotics. Transfer stable patients who require intervention (normally bronchoscopy) that is not available at the current facility. Typically, this will be pediatric patients who are transferred to a pediatric center. Ensure ALS personnel who are capable of airway management in case of deterioration are used as the transport team. Avoid feeding children younger than 3 years dried nuts, such as peanuts, which account for a large majority of tracheal aspirations in this age group. Preoperative steroids and antibiotics may reduce complications such as airway edema and infection. These agents have anti-inflammatory properties and cause profound and varied metabolic effects. Corticosteroids modify the body's immune response to diverse stimuli. Dexamethasone (AK-Dex, Alba-Dex, Baldex, Decadron, Dexone) has many pharmacologic benefits but significant adverse effects. It stabilizes cell and lysosomal membranes, increases surfactant synthesis, increases serum vitamin A concentration, and inhibits prostaglandin and proinflammatory cytokines (eg, TNF-alpha, IL-6, IL-2, and IFN-gamma). The inhibition of chemotactic factors and factors that increase capillary permeability inhibits recruitment of inflammatory cells into affected areas. It suppresses lymphocyte proliferation through direct cytolysis and inhibits mitosis, breaks down granulocyte aggregates, and improves pulmonary microcirculation. Methylprednisolone (Depo-Medrol, Depopred, Medrol, Methylone, Solu-Medrol) decreases inflammation by suppressing migration of polymorphonuclear leukocytes and reversing increased capillary permeability. Nafcillin (Nafcil, Nallpen, Unipen) is the initial therapy for suspected penicillin G-resistant streptococcal or staphylococcal infections. Use parenteral therapy initially in severe infections. Change to oral therapy as condition warrants. Due to thrombophlebitis, particularly in elderly persons, administer parenterally only for short term (1-2 days); change to oral route as clinically indicated. Cefazolin (Ancef, Kefzol, Zolicef) is a first-generation semisynthetic cephalosporin that, by binding to one or more penicillin-binding proteins, arrests bacterial cell wall synthesis and inhibits bacterial replication. It has a poor capacity to cross the blood-brain barrier. It is primarily active against skin flora, including S aureus. Cefazolin is typically used alone for skin and skin-structure coverage. Regimens for IV and IM dosing are similar. Ketamine elicits profound dissociative and amnestic actions. It does not affect pharyngeal-laryngeal reflexes and, thus, allows a patent airway as well as spontaneous respiration to maintain intact. Ketamine (Ketalar) is a short-acting dissociative anesthetic and analgesic agent. It acts on the cortex and limbic system, decreasing bronchospasm. Sersar SI, Rizk WH, Bilal M, El Diasty MM, Eltantawy TA, Abdelhakam BB, et al. 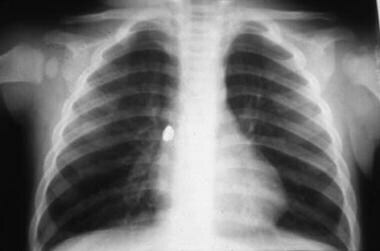 Inhaled foreign bodies: presentation, management and value of history and plain chest radiography in delayed presentation. Otolaryngol Head Neck Surg. 2006 Jan. 134(1):92-9. [Medline]. Chiu CY, Wong KS, Lai SH. Factors predicting early diagnosis of foreign body aspiration in children. Pediatr Emerg Care. 2005. 21(3):161-4. [Medline]. Saquib Mallick M, Rauf Khan A, Al-Bassam A. Late presentation of tracheobronchial foreign body aspiration in children. J Trop Pediatr. 2005 Jun. 51(3):145-8. [Medline]. Cataneo AJ, Cataneo DC, Ruiz RL Jr. Management of tracheobronchial foreign body in children. Pediatr Surg Int. 2008 Feb. 24(2):151-6. [Medline]. Gregori D, Salerni L, Scarinzi C, Morra B, Berchialla P, Snidero S, et al. Foreign bodies in the upper airways causing complications and requiring hospitalization in children aged 0-14 years: results from the ESFBI study. Eur Arch Otorhinolaryngol. 2008 Aug. 265(8):971-8. [Medline]. Tariq SM, George J, Srinivasan S. Inhaled foreign bodies in adolescents and adults. Monaldi Arch Chest Dis. 2005 Dec. 63(4):193-8. [Medline]. Gang W, Zhengxia P, Hongbo L, Yonggang L, Jiangtao D, Shengde W. Diagnosis and treatment of tracheobronchial foreign bodies in 1024 children. J Pediatr Surg. 2012 Nov. 47(11):2004-10. [Medline]. Saliba J, Mijovic T, Daniel S, Nguyen LH, Manoukian J. Asthma: the great imitator in foreign body aspiration?. J Otolaryngol Head Neck Surg. 2012 Jun 1. 41(3):200-6. [Medline]. Digoy GP. Diagnosis and management of upper aerodigestive tract foreign bodies. Otolaryngol Clin North Am. 2008 Jun. 41(3):485-96, vii-viii. [Medline]. Sasso R, Bachir R, El Sayed M. Suffocation Injuries in the United States: Patient Characteristics and Factors Associated with Mortality. West J Emerg Med. 2018 Jul. 19 (4):707-14. [Medline]. [Full Text]. Haliloglu M, Ciftci AO, Oto A, et al. CT virtual bronchoscopy in the evaluation of children with suspected foreign body aspiration. Eur J Radiol. 2003 Nov. 48(2):188-92. [Medline]. Huang HJ, Fang HY, Chen HC, Wu CY, Cheng CY, Chang CL. Three-dimensional computed tomography for detection of tracheobronchial foreign body aspiration in children. Pediatr Surg Int. 2008 Feb. 24(2):157-60. [Medline]. Bai W, Zhou X, Gao X, Shao C, Califano JA, Ha PK. Value of chest CT in the diagnosis and management of tracheobronchial foreign bodies. Pediatr Int. 2011 Aug. 53(4):515-8. [Medline]. Tokar B, Ozkan R, Ilhan H. Tracheobronchial foreign bodies in children: importance of accurate history and plain chest radiography in delayed presentation. Clin Radiol. 2004. 59(7):609-15. [Medline]. Assefa D, Amin N, Stringel G, Dozor AJ. Use of decubitus radiographs in the diagnosis of foreign body aspiration in young children. Pediatr Emerg Care. 2007. 23(3):154-7. [Medline]. Girardi G, Contador AM, Castro-Rodriguez JA. Two new radiological findings to improve the diagnosis of bronchial foreign-body aspiration in children. Pediatr Pulmonol. 2004. 38(3):261-4. [Medline]. Brown JC, Chapman T, Klein EJ, Chisholm SL, Phillips GS, Osincup D. The utility of adding expiratory or decubitus chest radiographs to the radiographic evaluation of suspected pediatric airway foreign bodies. Ann Emerg Med. 2013 Jan. 61(1):19-26. [Medline]. Ciftci AO, Bingol-Kologlu M, Senocak ME, et al. Bronchoscopy for evaluation of foreign body aspiration in children. J Pediatr Surg. 2003 Aug. 38(8):1170-6. [Medline]. Divisi D, Di Tommaso S, Garramone M, Di Francescantonio W, Crisci RM, Costa AM, et al. Foreign bodies aspirated in children: role of bronchoscopy. Thorac Cardiovasc Surg. 2007 Jun. 55(4):249-52. [Medline]. Zhang X, Li WX, Cai YR. A time series observation of Chinese children undergoing rigid bronchoscopy for an inhaled foreign body: 3,149 cases in 1991-2010. Chin Med J (Engl). 2015 Feb 20. 128(4):504-9. [Medline]. Tenenbaum T, Kahler G, Janke C, Schroten H, Demirakca S. Management of Foreign Body Removal in Children by Flexible Bronchoscopy. J Bronchology Interv Pulmonol. 2017 Jan. 24 (1):21-8. [Medline].